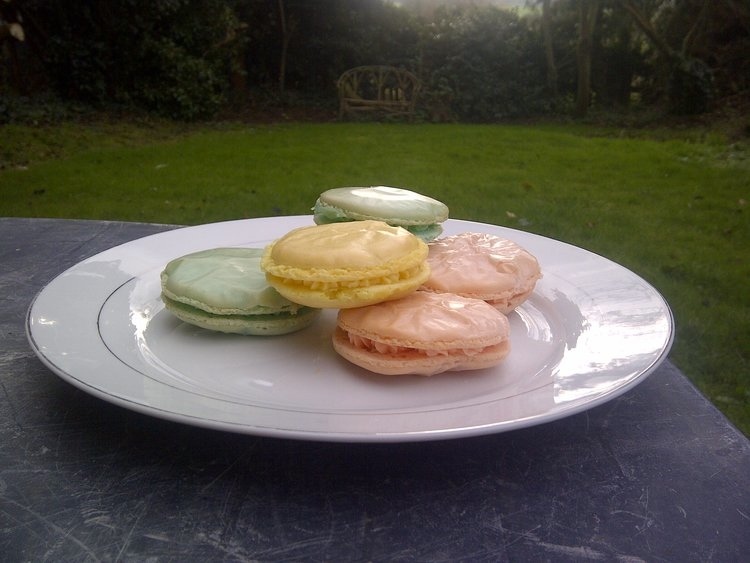 My daughter and I made some macaroons at the weekend. These certainly aren’t going to win any prizes for the prettiest macaroons, but as macaroons are notoriously tricky, and as this was our first attempt, I hope you can forgive us a few imperfections! 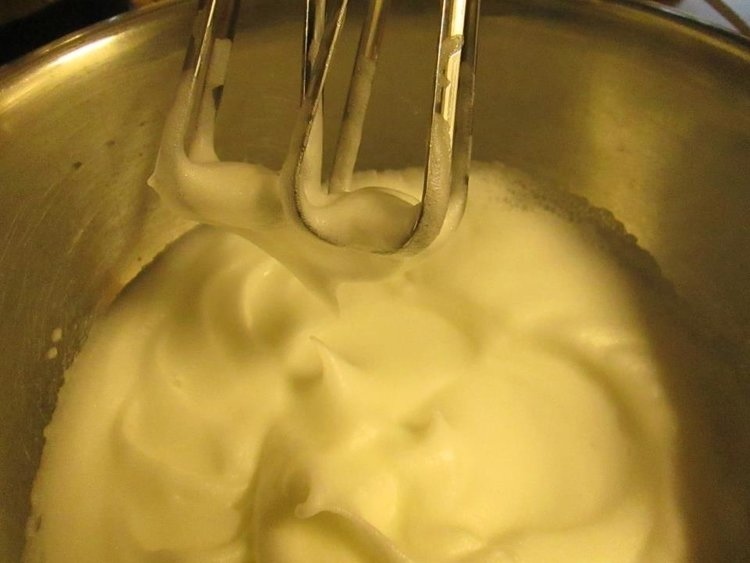 2) Whisk the egg whites with the pinch of salt in a separate bowl until it forms soft peaks, and then gradually whisk in the caster sugar. 3) Stir in your flavours and colours. You will have to use your own judgement as to type and quantity. We separated the mixture into three bowls. 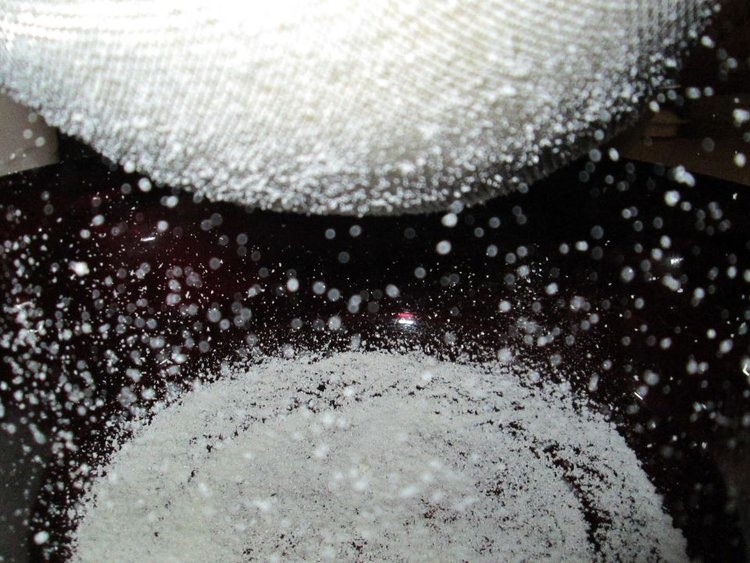 We added a few drops of natural food colouring and half a teaspoon of flavour essence in each one. The first was green and peppermint, the second was pink and strawberry, the third was yellow and lemon. 4) Cut and fold half of the almond/icing sugar mix into the eggs, then work in the other half (obviously if you have more than one bowl of egg mixture like we did, then divide it up accordingly). 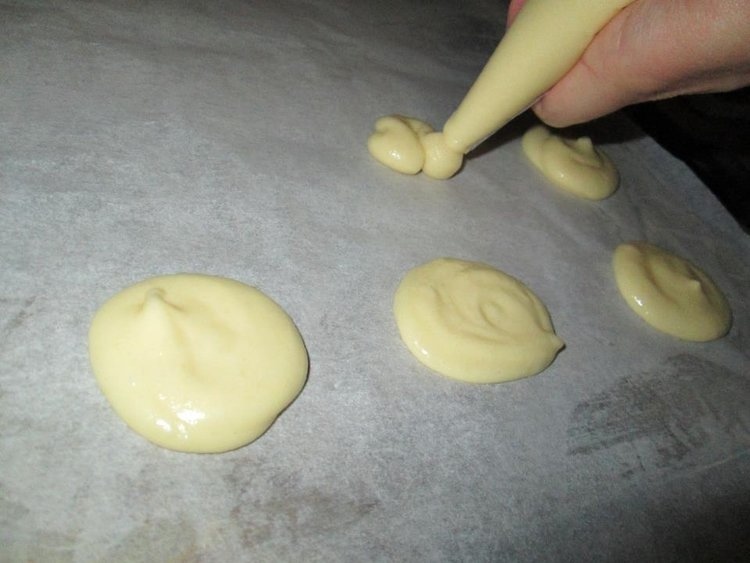 5) Pipe circles of the mixture on to a baking sheet covered with baking paper. This is where it went wrong for us. We knew that the recipe should yield 20 macaroons, but we didn’t click that this meant we needed to pipe 40 circles so as to end up with 20 when they are sandwiched. This complicated mathematical calculation eluded us. Consequently our macaroons ended up twice as big as they should (you should aim for approx 3cm across and then you should have 40 of them). 6) Give the baking sheet a sharp tap on the work surface, and then leave them to stand for about 20 mins until a slight skin has formed on the outside of them. While they are standing, pre-heat the oven to 160°C (320F), or 140°C (280F) if fan oven, or gas mark 3. 7) Bake for 15 mins. Because ours were twice the size they were meant to be (and we still hadn’t realised), we took them out after 15 mins and could tell they weren’t done, but as we hadn’t made them before, we weren’t exactly sure how they should look when they are done, so we did them a bit longer but probably not long enough as they ended up too chewy. But when you do think they’re done, leave them to cool for a few mins on the sheet and then they should come off fairly easily with a spatula. 8) Make the filling by beating the softened butter with the icing sugar and add in the same flavourings and colourings that you added into the macaroon mixture. We did the quantity by sight and taste, I would advise going more powerful with the flavouring in the filling than in the macaroon. I also found the ratio of butter to icing sugar to be quite high in this filling, maybe that’s the way with macaroons, I don’t know. Fill and sandwich the macaroons. Ideally place them in an airtight container in the fridge for 24 hours before serving. The macaroon recipe we followed was basically this one, but with some bits of info gleaned elsewhere incorporated in. If you search online there are many different suggestions for flavour combinations, and different kinds of fillings, and I’m certainly going to experiment more with these. Have you made macaroons before? Any tips? Le Clown has never made macaroons before. But. He’s eaten quite a few, and he would eat some more this morning with his coffee. Yes, I’m always game to try new recipes! Your photos are gorgeous, and I have to salute you and your daughter for making these (they look like they came out beautifully, too). They weren’t quite as smooth and perfect looking as I had hoped, but I think they were good enough that I didn’t mind showing them on here! I would definitely go for the smaller size though if I made them again, they punch quite a sugar hit and the bigger ones were too much sugar in one go for me! 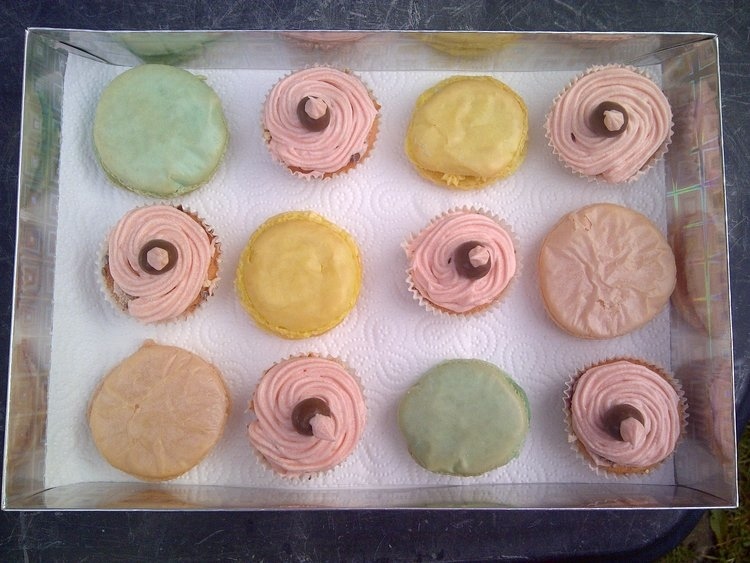 Thanks Pete, I should imagine the ones made on the Great British Bake Off were rather more successful than ours! Still, I think our second attempt will be more successful now that we’ve learnt a few things. I have not made them before, but they look yummy. May I have one? Yes, you certainly can, I’ll give you a lemon one, they’re the ones that came out best, and you deserve only the best. I’ll trade you a slice of cake for a lemon macaroon. Let’s hope they don’t crumble and rot in the mail. Perhaps we’ll have to settle for virtual instead. Guess our thighs will thank us. I think these look pretty awesome! They tasted pretty good, but they’re not as visually pleasing as they should have been!